A Whole Lotta Nothing... I can't wait for it. I can't wait to take in what I took for granted before the jumble of life happened. Before I leapt into nightly college courses all-nighters to cram for an exam homework..and more homework saying, "tomorrow...I promise." Instead... I'm going to enjoy. And let out that huge breath I've been holding in all year. Yay! I. Can. Not. WAIT!! You are so close to your summer break! Hang in there, it's just around the corner!!! 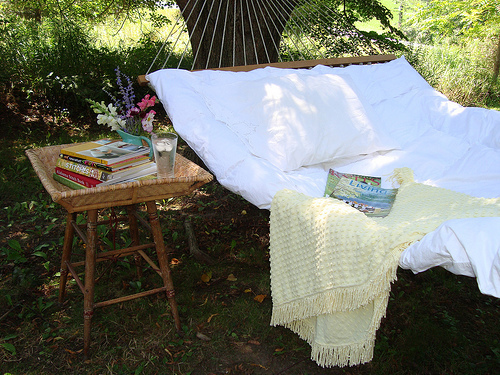 I keep telling you this: That hammock looks divine. I hope you get to spend some time in one this summer! Oh my gosh I can't wait either! Summer school is over the last week of June, so the month of July will be my summer. I'm looking forward to the exact same things as you! Haha! Let's just say I can't wait for you to read my tomorrow's post! I'm such a fail! I'm coming to your house for the Summer! Ooooh - does that come without mosquitos? Or ticks in Pidg's case. Summer isn't my favorite but you make it so appealing. Don't Forget about Me on July 1st, k? !